Rapa Nui, perhaps more commonly known as Easter Island, is a Chilean island located 3,700 km west of the coast in the South Pacific Ocean. The islands diameter is roughly 150 square miles and is defined by three prominent volcanoes. The date when Rapa Nui was initially inhabited is widely disputed, but for the purpose of this essay it suffices to say that it was populated sometime between 400 and 1200 AD. As will be discussed later, the inhabitation date is not the only aspect of Rapa Nui’s history that has been debated. Nevertheless, one can garner a good understanding of the fragile relationship that existed (and still exists) between mankind and the environment. 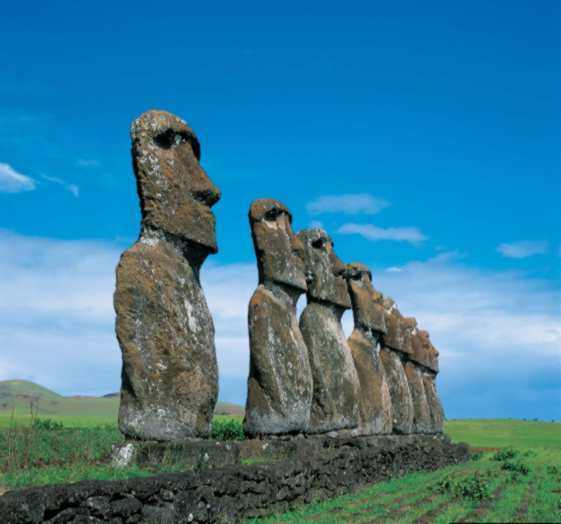 The first European visit to Rapa Nui was conducted by the Dutch Admiral Roggeveen on Easter Sunday 1722. The Admiral found a barbaric, cave-dwelling and cannibalistic society. But what really interested the first European visitors was the evidence they discovered indicating that the inhabitants of the island were once a fairly advanced society. Additionally, dotted across the island were over 600 hefty stone statues. Accomplishing this feat would have certainly required more sophistication and craftsmanship then its early 18 th century inhabitants possessed. Thus began the mystery of Easter Island. What happened to its original inhabitants? There were initially no clear explanations. The ground was fertile enough for potatoes to be grown with extreme ease, and the island’s volcanoes had been dormant for centuries. Eventually, scientists came up with the theory that the cause of the collapse was “massive environmental degradation brought on by deforestation of the whole island. (Pointing, 5)” The deforestation had numerous detrimental effects, most notably making the soil unsuitable for crops. Additionally, timber became scarce for essential activities such as constructing houses for shelter or fishing canoes for sustenance. It should be noted that outside interference by slave traders also had an impact on the decline of the Rapanui. Nevertheless, the deforestation was clearly a cause, most likely the predominant cause. What is not clear is exactly why the deforestation occurred. The theory that until recently was accepted by most as fact involved the island’s stone statues. These statues, called ahus, required extensive transportation from the rock quarries they originated from. This was most likely done by the use of long tracks constructed from the island’s trees. The competition among factions of the Rapanui to build ahu became so intense that more and more trees were required, eventually decimating the tree population. The Rapanui essentially dug their own graves in a blind effort to satisfy their self-constructed customs. Recently new research has been conducted that suggests that rats, not humans, played the most significant role in the island’s deforestation. (Hunt, 2006) When the island’s initial inhabitants arrived, they brought chickens and rats along in their canoes for food. Since the rats had no major natural predators on the island, they most likely multiplied at a rapid rate causing their population to grow exponentially. The masses of rats then fed on the palm seeds of the trees, eventually leading to the islands deforestation. Thus the exact cause of the deforestation remains ambiguous. What is clear is that the influences of the settlers were ultimately the cause, whether it is through direct chopping of the trees or by indirectly infesting the island with rats. So what lessons must be learned? For starters one can appreciate the importance of society not being consumed with establishing its greatness. The ahu were believed to be glorified status symbols. Rival clans constructed the statues to try and prove that their faction of society was superior. The intense focus placed on achieving dominance caused the Rapanui to lose focus of the true dominating force on the island; the island itself. This quest for greatness can be directly associated with humanities greed, which some feel is an inherent human characteristic. Whether or not humans are genetically predisposed to lust for more is an entirely different topic, but either way the Rapanui showed us that a failure to harness this desire can have catastrophic consequences. One can only hope that the plight of the Rapanui was not in vain. The demise of this fairly advanced Polynesian society hopefully can serve as an example to those today who still take their surroundings for granted. Comparing the 150 square mile Easter Island to the entire Earth is perhaps a severe overstatement. But it should be noted that the world does have limited resources and there is no foreseeable escape plan, two main factors that led to the demise of the Rapanui. If humanity continues to abuse the environment then it is quite possible, if not likely, to have severe global implications. Thus perhaps the main lesson one can derive from the downfall of the Rapanui is that “ecosystems are complex, and there is an urgent need to understand them better (Hunt, 8)” before it is too late. Ponting, Clive. A Green History of the World: The Environment and the Collapse of Great Civilizations. St. Martin's Press, New York, 1991. ISBN 0-312-06989-1, McCabe GF75.P66 1992 pp. 1-7.